Google Massive PBN Deindexing Update - PBN Is Dead! 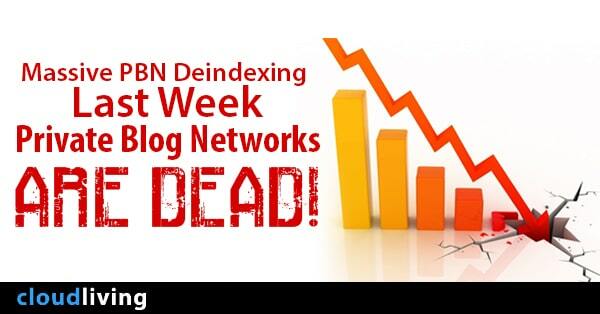 Home » Blog » Massive PBN Deindexing Last Week: Private Blog Networks Are Dead? It’s clear that private blog network (PBN) has been one of the most effective ways to rank websites for years. And it did work really well for me and a lot of other people too. But the good old times are gone. For the past month or two, Google has been slowly rolling out a new update that deindexes a ton of PBNs and the peak seems to happen last week when a lot of people got affected and some bloggers reported that on their blogs. Spencer and Perrin from NichePursuits lost over $10,000 in monthly revenue combined. The guys from NohatDigital lost around 40% of their massive PBNs. Aaron C from NicheSiteStudy also lost 41% out of 200 PBN sites. One guy from WarriorForum got 60% of his PBN deindexed. Looking at these numbers, I bet you would never want to mess with Google again. Personally, I wasn’t affected because I have foreseen this and killed my PBN or any PBN-related projects since March. I’ve also dropped a few hints on Twitter about this too. Stop building or getting links from PBN. Build an authority site and focus on legitimate link building methods like networking/outreach. I’m done with PBNs and I will never talk about it on Cloud Living again. Yes, there are sites that are still ranking well on Google with PBNs despite the update. But who knows if they’re gonna survive the next updates? We can never win this game! It’s time to focus on building sustainable businesses that can thrive years after years. That’s the new direction I mentioned above. And actually, this is the best time to start your new website project as lots of sites got penalized and the competition is easier and fairer. You just need to put in more time and effort on creating high quality content and learning white-hat link building. What I’m Working On Now? And What You Can Expect From Cloud Living? Well, a lot of cool things are happening behind the scene. I got a new authority coming up and one of my Amazon sites which was penalized 5 months ago now just got its rankings back after the update (it was penalized around February). The funny thing is that It does have a few PBN links. I’m very excited for the site and I’m working hard to grow the traffic so I can cash in during November/December. I will keep you guys updated on the progress. Was you affected by the update? What do you think about the future of PBNs? I’d love to hear your thoughts in the comment section. It’s great that you can just shrug off this whole PBN thing because you were already moving away. “I told you so!” comes to mind! Dead? Sure… dozens of keywords rank in the top 10 just like they did a month or 6 months ago. Try “best adjustable dumbbells” or “best survival knives”. And these are only a few, AND these are the ones everyone knows about. There are many more still ranking, all using PBN’s. lol whats wrong with you online gurus out there. Everyone preaching that their PBN got deindexed. You should not throw in the towel so fast(If you want to then atleast dont publicize it like this to spread rumours). I own a pretty large PBN and hardly a few of them got deindexed but I know why they got. Anyway, I would like to say is PBN is NOT dead. If you are publishing your site like this then surely you can expect google to crack on that and what about competitors reporting your PBN? You should learn to mask yourself among the various legit sites out there and it should definitely work. Sure there are still sites that are ranking well with PBNs. But who know how long they are gonna survive with new updates? My point is that PBNs are no longer a reliable way to build backlinks and we shouldn’t build our business based on that. Well that is true. There are 2 types of income goals. Long term and short term. Short term is by using PBN and long term is by outreach and other natural ways. You shouldn’t just shrug off by saying “PBN is dead”. It definitely works but its just that some things need to be taken care of like hosting on cheaper hosts. That’s what google is targeting now since they dont want newbies to buy those cheap hosts and start linking them to their site. I agree with you. Google will never be able to find and kill all the PBNs. And there will be always a way to mask your PBNs. But even new sites now take much longer to rank so why not focusing on building long-term sites instead? Anyway, this really depends on the risk management strategy of each person. Thanks for calling me “guru” but no I’m not. I’m just a learner and I share my thoughts on my blog. People will have to make their own decision on this. Hey Jesse, the reason so many bloggers, ourselves included, are coming out with saying their PBNs got hit is because it’s the right thing to do. Spencer for example has tens of thousands of true fans that rely on him for information. When you’re in a position of influence like that and have information that can help people eg. that PBNs are risky now, (I don’t think they’re dead by the way, but risky yes), you’ve got to reveal it. Pretty much anyone who’s used PBNs on a large scale has been affected and it’s great they’re all communicating that to their audiences. Hey, good new for your site. My sites are doing fine as well. I did only few PBN links and decided not add more of these links. My plan is going just like you, Authority site. Ill stat next year. I have heard this information many times. If we keep secret our PNBs carefully, how can Google find out our PNBs, then kicks them to the hell. I think that is not a reason to get penalty from Google. I am still finding the reason why Google penalties PNBs (Just open discussing). Well I admitted that i sucked at creating PBNs….40% of them sucked, but the rest of 60% is brilliant! 🙂 No offence, but same goes to Spencer’s, perrin’s, Jon’s and nohat’s network, they all sucked, otherwise they wont be deindexed in the first place, haha! We all learned from our mistake, don’t be discouraged, keep your chins up and rock on. All i know is PBN is not dead though, just stick to what is working best for you is my best piece of advice. Thank you for the good advice. I have been working on my authority site for some time now. It is so tempting to rush things especially when you are in a financial crisis. I was thinking about creating my own “personal blog network” by creating mini sites. Now that google has made this update, I think I will be staying away from this link building strategy. On the bright side, this is a great opportunity for beginners like me to dominate google by doing things the right way. I have learn a lot from you and it makes me a little mad to see people bashing you because you mentioned ” PNB ARE DEAD” these are some of the same people that you inspired in the past. We all are entitle to have an option, but come on people let’s be professional about what we say on a public forum such as this one. The message is clear: if you try to beat the system, google will hunt you down and destroy all of your hard work. Thanks Jimmie for your supportive words! Any site that relies on search traffic is vulnerable. Longer term I think I might switch to paid traffic. I really don’t know why people were using services like Rank Hero after what happened to Build My Rank and all the others. Very irresponsible. Hey Tung – I had some impacts that I’ll share coming up soon. Nothing major monetarily but it’s a bit of a set back on my case study. I’m excited to hear about your new authority site. Very awesome! That’s the reaction Google is expecting from SEOs. Hell yeah PBN will get cheaper now. Amen bro, my thoughts exactly. It’s like Glen Allsopp said. Hey Tung, interesting thoughts…Google hasn’t changed the fundamentals that allow PBNs to work…just made it harder to build PBNs. Regarding my de-indexation…your headline for me is misleading. less than 10% of 800 PBN websites for truly private PBNs that my team has built for clients has EVER been deindexed not just in the last week. Public PBNs are incredibly hard to pull off without any risk of detection and using any form of linkbuilding comes with risks. Edited. Thanks for your comment Jon! Hey, 12 mths ago I change from building niche site to authority site and I am glad that I had made the change. At least now I no worry so much about algo update. Awesome man 🙂 I’m happy for you. I’m running authority sites, but I don’t wanna put all my eggs in the same basket, so I’ve decided to create authority + Niche sites to make more money. Google makes some change >> SEOs screaming the method is dead >> Dust Settles >> Someone Discovers a small pattern >> theorize the solution >> Sell the new solution for hard cash >> everybody jumps on the bandwagon >> Google makes Some change…. Don’t be so definitive about any update tung tran, the only problem with SEOs is that they fill their PBNs with low quality content, themes, web structure and also they are use to leave footprints for Big G, because they don’t want to waste time. The right way in front of me to run a pbn is having domains’ hosting and registrar info different, no SEO hosting or cheap hosting, every blog should have good content, each should have pages like contact us, about us, each should have different emails, webmastertool and analytics accounts. I’m not that PBN guy, I just run authority web, because I know much about SEO, but still I’m improving my writing skills because the traffic I get from my content can’t be grabbed from SEO of low quality webs…. I saw this coming coz everyone was creating a Private Blog Network as we all know Google wants to stay top of the game by thwarting every effort made by SEO(s). In the long run building an authority website that ranks naturally remains the best perspective in this industry, something most people dont want to do. Thanks Tung, For sharing this. And I agree with you, this time PBN is not enough to get high ranking infect its out dated. We should try something new. Fantastic thought i was going nuts there. I always thought it was a bad sign to have 2 or more sites with same ip linking to your site. So just to clear up, when you have this kind of setup with a large host like godaddy/hostgator it would be practically impossible to close down other PBNS’s if one of your PBNS’s is compromised. If there are 4000 websites on that same IP they would have to basically blacklist the whole lump (“good” sites included). On the other hand using a cheaper lesser known host it might be easier to check for google just by checking the % of “bad” sites and then decide to blacklist the whole bunch. By the way compliments on the great info on your website, really cleared up a lot for me!